Experience the pristine beaches, amazing landscapes and abundant wildlife of Fraser Island as well as perfecting the art of driving on sand. Relax or party at our exclusive camping area, Cathedrals on Fraser. As Fraser Island’s only private campground, Cathedrals on Fraser offers a lush and pristine setting situated on 25 acres. 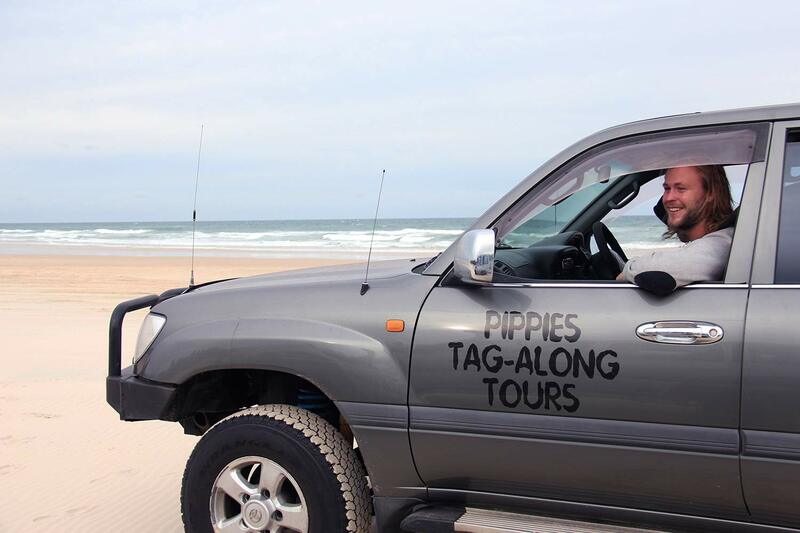 Why Tour with Pippies Fraser Island tag along tour? Experience the ultimate Australian beach 4WD driving and camping adventure on Fraser Island with Pippies Fraser Island Tour. We supply everything from Hostel accommodation, 4wd Hire to all Camping Equipment required on Fraser Island, and it is all done from Pippies Beachhouse at Rainbow Beach. You will be on Fraser Island in just 20 minutes, after packing your 4wd making more time to experience the worlds largest sand Island! Visit World Heritage listed Fraser Island (K’Gari) with Pippies’ Fraser Island 4wd Tours on the ultimate Australian beach 4×4 driving and camping adventure. Experience 4×4 driving yourself in one of our tag-along vehicles whilst visiting the most amazing freshwater lakes and ancient rainforests. Bathe in the Champagne Pools and view incredible marine wildlife from atop Indian Head. View the Maheno shipwreck stranded along 75mile beach set against the incredible coloured sands. Grab an inflatable tube and float down the famous Eli Creek. 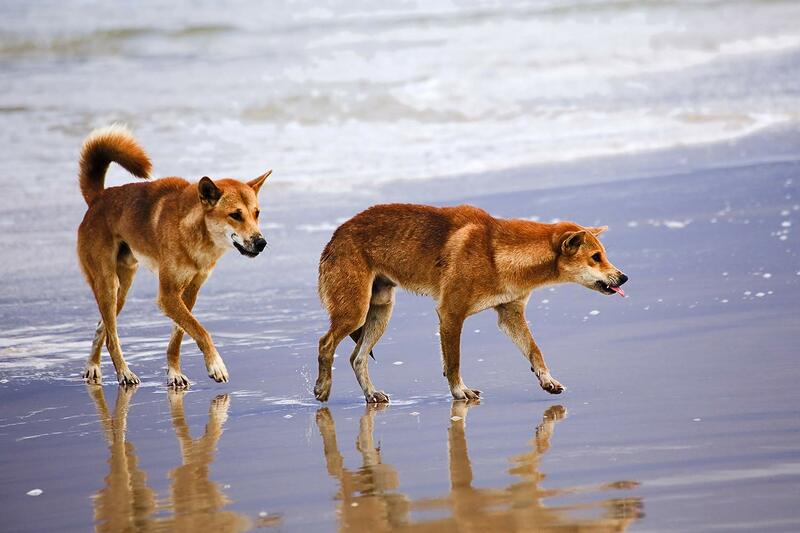 Be sure to look out for the wild dingo’s while driving along the beach. Leave Pippies Beachhouse 7am sharp, our Fraser Island Tours kicks off with a 20min barge ride from Inskip Point to Fraser Island. Arrive at Lake McKenzie and take a dip in these incredibly pure, clear waters. Words do not do this amazing lake any justice. Drive to Central Station where we eat lunch and walk along the waters of the very special Wanggoolba Creek. 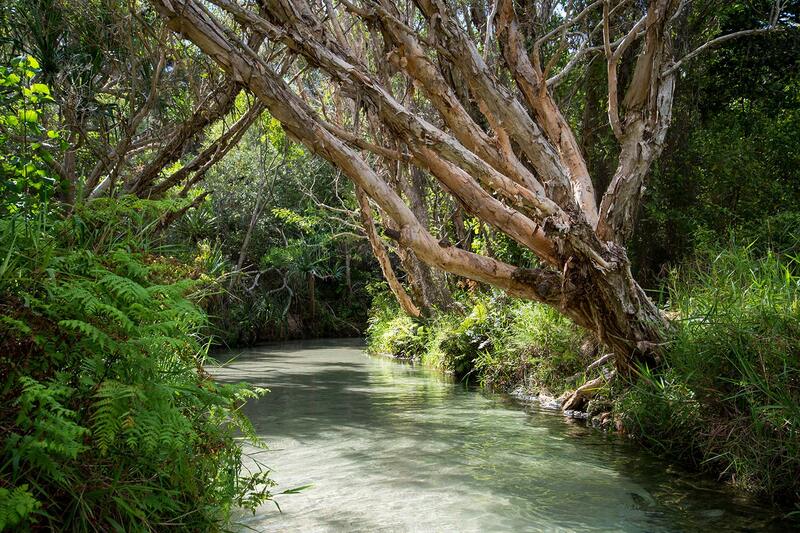 Learn Fraser Island’s history in a time before this beautiful island was protected. We then leave for a drive back to 75-mile beach and onto Pippies camp. Arrive at our incredible campsite and chill after a long day. Dinner time! Cook a BBQ together with your new Fraser Family and spend the night socialising together next to a campfire or under the covered seating area. Wake up early (hangovers are no excuse!) to a simple, easy breakfast of toast and cereal before getting back in the cars to head further north. Arrive at the Champagne Pools to cleanse under awesome waves crashing over into the natural rock pools, creating the bubbly “champagne.” Then back to the cars again for a short drive to our next destination. Climb the stunning Indian Head (one of the few rocks formations on the island) to spot the amazing marine wildlife that can be seen off of Fraser Island. If luck is on our side, we can normally spot Humpback Whales (August – October), Sharks, Sea Turtles, Dolphins, huge Rays and many schools of tropical fish. Next a drive back to Pippies camp for lunch and then onto our next location. A short drive down the beach is the largest creek on the Eastern Beach; Eli Creek. Take a walk up the boardwalk with a rubber ring and float down these serene waters. Eli Creek pumps up to 4 million litres of fresh water into the sea every hour! 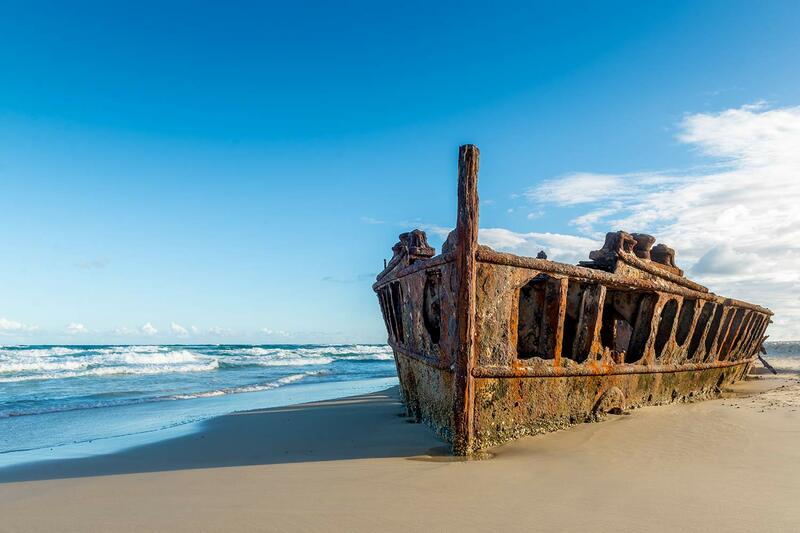 The second to last location of the day is a short drive from Eli Creek and Pippies’ Fraser Island Tours camp; the Maheno shipwreck. As the sun lowers in the sky watch the rusty wreck against the sea sky and incredible coloured sands seen up the coast. Finally, a short stop at The Pinnacles on the way back to Pippies camp. Seen from the beach this sand formation is a prime example of the coloured sands seen all up the Fraser Coast. Arriving back at Pippies camp to take a breather after an amazing day, wash away the sand in the amazing amenities block just a short walk from our campsite…… then more food! As part of our Fraser Family, we cook spaghetti bolognese together with garlic bread, followed by another night of socialising under some of the Southern Hemisphere’s most spectacular stars. Wake up for your last day in paradise! Another quick and simple breakfast before setting off to the final location on our Fraser Island Tours. Drive a moderate distance down the Eastern Beach to the entrance of Lake Wabby. Here we will walk for around 40-45 mins down a beautiful sand track through the bush and out onto the Hammerstone Sandblow. 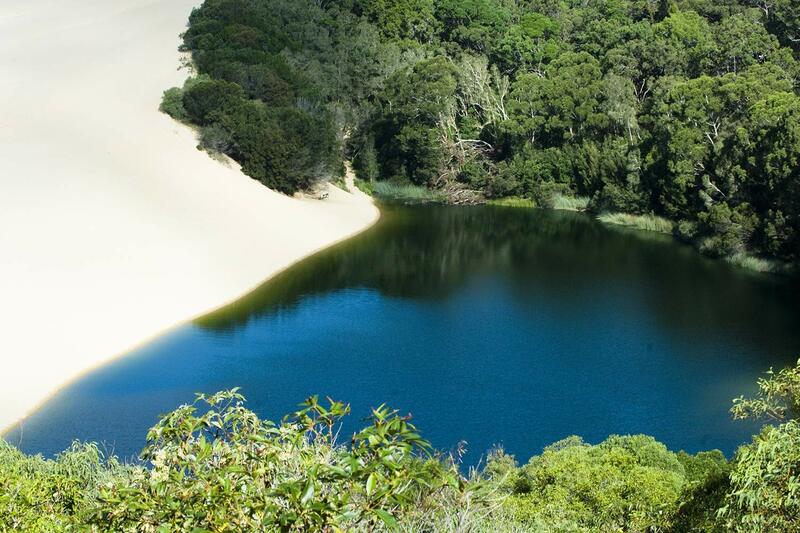 Located a short walk along the sand blow, Lake Wabby is the deepest lake on Fraser Island. So be sure to take a dip and chill next on its shores. After our lunch on the beach, it is time to make our way back to the barge and Rainbow Beach. But not before hunting for the mysterious Eugarie and learning the meaning of our name: Pippies! Arrive back at Pippies Beachhouse in Rainbow Beach between 1pm and 4:30pm. (dependant on the tides) Chill for one last night with your new Fraser Family! YOU MUST ATTEND THE COMPULSORY 4PM PRE-BRIEFING THE DAY BEFORE YOUR TOUR IS BOOKED TO DEPART: bringing $10 cash levy + credit/ debit card and your driver’s licence for our paperwork to be filled out. Drivers must be 21 years or over with a minimum of 12 months experience on an open licence. Sleeping bag and pillow hire for $10 and $3 respectively. Organise this at Pippies Beachhouse at the 4pm Briefing the day before departure, you will receive them when at the campsite on Fraser Island. Locker can be rented for $2 per day at Pippies Beachouse for any larger valuable items. Sunscreen, Insect repellant and water bottles are available for purchase from reception before departure.! Please give us a call (+61 7 5486 8503) and reconfirm your Fraser Island Tours Booking 2 days before arriving at Pippies Beachhouse. Please be sure to attend the mandatory safety briefing at Pippies Beachhouse, Rainbow Beach the day prior to your tour departure at 4 pm SHARP. At that briefing please make sure you bring your driver’s license (if eligible to drive), credit/debit card and $10 cash. To drive on tag-along Fraser Island Tours it is outlined by the Queensland Government that you must be over the age of 21 and have held your full open license for at least one while year.